The older I get, the more melancholy I feel around Christmas. Don’t get me wrong. I LOVE the holiday season. I love the traditions and Christmas trees and cookie baking and lights and carols. But the innocent, pure joy and excitement I felt as a child have given way to a more nuanced experience of the holidays. This year, as I decorated our Christmas tree, I was reminded of my blog post from two years ago entitled Christmas Memories. Just as I related in that post, the powerful remembrances elicited by unpacking our boxes of family Christmas decorations are enough to plunge me into sudden gloom. Even though I am generally excited about the upcoming holidays (especially for our son’s homecoming tomorrow), I found myself taking frequent breaks (cookies, coffee and chocolate seemed to help) as memories of people and places and times past came flooding back. I grieved over the loss of my beloved parents and stepson, and a broken relationship with another family member. I missed the days when our son was a young boy and I was a young mom. The mere recognition of the passage of so much time causes its own despair. I find myself grieving over our broken world. The seemingly everyday news of bombings and shootings and ISIS and terror feels overwhelming to me. I’m often disappointed by a lack of clear moral leadership coming from political (highlighted in this current presidential election circus) and religious leaders. While preparing for our family Christmas, I heard from two friends experiencing tragic circumstances amidst this holiday season. One friend’s son was seriously injured in a sports-related accident, her father died, and she broke her hip – all within a couple weeks. Another friend, as a result of a series of setbacks, was on the brink of losing her home. I felt heavy and helpless. What am I to do with all this suffering? And how can I feel the joy of the season with so much brokenness around me? I did what little I could for my friends – I visited the first friend, brought her lunch, Christmas cookies and a wreath (since she couldn’t drive to get one). I sent the other friend some money and prayed for her. But I struggle with a sometimes overpowering sense of futility and pain when people around me are hurting. How can I feel the joy of the season with so much brokenness around me? In those days a decree went out from emperor Augustus that all the world should be registered. This was the first registration and was taken while Ouirinius was governor of Syria. All went to their own towns to be registered. Holy cow! Was the family of Jesus Christ an early example of Syrian refugees? As I sat contemplating current events in light of this text, I abruptly felt the convergence of the past, presence and future. I was unexpectedly comforted by the words of carols, many I’ve heard since I was a child, but which in that moment took on new and powerful meaning. This past Saturday, the 2015 Heisman Trophy was awarded in New York City. The previous Monday night, I excitedly watched live as the finalists were announced. When only three names were read, and Keenan Reynolds (senior quarterback at Navy) was not one of them, I felt an overwhelming disappointment. First let me say, congratulations to all three Heisman finalists. They are worthy recipients and I wish not to diminish their accomplishments. Let me also say, I am a lifelong Navy football fan (USNA daughter, wife and mom) so its fair to say I am biased. Why am I so saddened about this year’s Heisman Trophy? I’ve spent some time reflecting about this. (Believe me, I rarely get worked up about anything sports-related.) I am disappointed because it was an enormous missed opportunity. The Heisman Trust and voters had a chance to boldly look past cultural norms of success (Big Schools, Big Money) to choose someone who clearly embodies the aspirational qualities the Heisman purportedly stands for. I hate to single out the Heisman, but the award is emblematic of a larger problem in our culture, where role models are increasingly entertainers and professional athletes, and power and money equate with success, yet we lament the “moral decay” of our society. If we truly value integrity, we must proactively spotlight alternative role models who exemplify exceptional character. I think about some past Heisman winners, who may have been excellent football players and played for top college teams and pursued successful NFL careers, but whose high-profile conduct off the field (played out in the media) exhibited questionable character and choices. Are they good models of excellence with integrity? If I were in charge of awarding the Heisman Trophy, I would give it to Keenan Reynolds, a young man who personifies excellence with integrity. Reynolds deserved serious consideration for the Heisman Trophy based on his football accomplishments alone. In 2015, previously independent Navy joined the American Athletic Conference (amidst high anxiety as to how Navy would fare), and Keenan led the team to a 10-2 record, victories over Air Force and Army (securing the coveted Commander-in-Chief Trophy), and a national ranking of #21. Saturday he became the first quarterback in the history of the Army-Navy series to go 4-0 against its rival. This season, Reynolds received national attention for setting the record (previously held by past Heisman finalist Montee Ball) for most rushing touchdowns in NCAA Division 1 history (85). The list of his records and accomplishments is astounding. See NavySports.com for a more comprehensive review. More remarkable is the unprecedented impact Reynolds has had on the entire Navy football program, more than any Navy player I can remember. As a four-year starting quarterback (highly unusual at Navy) his mastery of Navy’s complicated triple-option offense is unmatched. 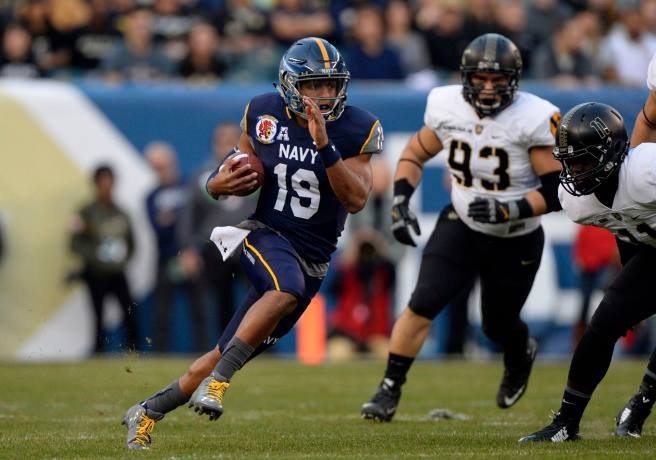 This offense capitalizes on quickness and QB decision-making to equalize Navy’s perennial size disadvantage. The triple option requires the QB to make the right split-second decision on every play, and under Keenan, the Navy offense clicked into high gear. The success of the Navy football team under Reynolds’ leadership infused the entire Naval Academy, indeed the entire US Navy, with enormous pride. Although only counting as one vote in the overall tabulation, Reynolds won the 2015 Heisman fan vote (partly due to a highly mobilized Navy fan base). Overall, Keenan finished fifth (the highest finish in the Heisman balloting by a Service Academy player since Navy’s Roger Staubach won the award in 1963). According to the Heisman website, between three and eight of the top candidates are invited to New York for the trophy presentation, and these are considered the Heisman Finalists for that year. Presumably because the vote totals dropped significantly after the top three candidates, only three finalists were invited to New York. Even more disappointing than Heisman voters overlooking this extraordinary young man was the failure of the Heisman Trustees to invite five finalists to New York. Since the Army-Navy football game (in Philadelphia) was the same day as the Heisman Trophy ceremony (in New York), Navy had plans to helicopter Keenan and his family to the ceremony. What an honor, indeed a source of national pride, it would have been to see Reynolds at the ceremony, on national TV, in his Navy service dress blue uniform. Would it have been such a stretch to invite two more finalists to the ceremony? A Heisman Trophy, even just an invitation to the ceremony, would have meant the world to not only Keenan and his family, but to all the Service Academies and to the men and women serving our country. It would have sent an important message recognizing one of their own as a shimmering example of “the pursuit of excellence with integrity.” I rooted for Keenan Reynolds for the Heisman not only because he’s Navy and deserves the award as a player, but also because he so impressively embodies those qualities we should demand in our role models. Although I am sad for him, I suspect Keenan Reynolds will have a bright future, with or without the Trophy. What our awards say about us is what makes me most sad. We spent this Thanksgiving with our son (my only child) in Florida. 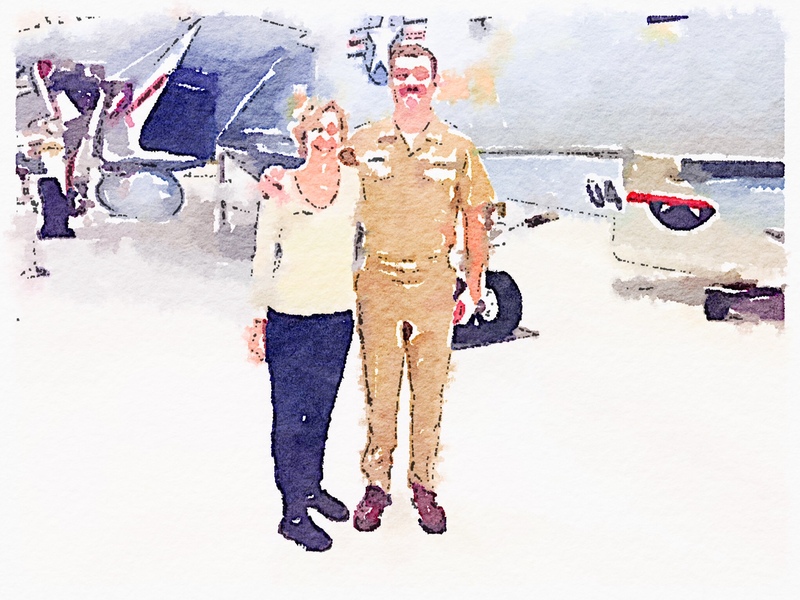 He graduated from the Naval Academy in May and is now waiting to start flight training. I am therefore passing into yet another new stage of parenting, having an adult college-educated son who is completely independent. He has an apartment, a car and a job. He really doesn’t need us for anything. Looking back, the two hardest transitions for me were his first day of kindergarten and the first month after he left home for college. My husband had to peel me away from the front door of the elementary school when we dropped him off at kindergarten. I blubbered all the way home about this being “the beginning of the end.” The first month of his “Plebe Summer” at the Academy, I missed him terribly. Our house and lives suddenly became strangely quiet, and I found myself pacing anxiously around the house and staring at his empty room. I physically ached from the loss of his everyday company. Somewhere around the beginning of his senior year at the Academy, long after finally and happily settling into my role as USNA Mom, I began to feel a pit in my stomach, knowing that my son would soon be leaving the relatively safe Academy environment (that I had grown to love) and that his chosen career would become increasingly dangerous as he pursues his future training and then faces prospective deployments. After we said good-bye this past May, following his graduation, we knew we might not see him again until Christmas. I anticipated another tough adjustment, but I have to say, so far this stage has been much easier than I thought. I feel surprisingly at peace being less actively involved in his life. I believe there gradually comes a point in the parenting relationship, where both our kids and we realize that it is us (the parents) that yearn for more time with them (the kids) than they yearn for with us. The early to mid twenties is also an important time for our kids to independently build their own identities. When I reflect on my own past with my own parents, I am reminded of the importance of “releasing” my son for his vital personal development. Besides, quite frankly, I find much in the life of a 22-year-old male somewhat unappealing, and often the “son” I miss hanging out with is the 8-year-old version (the one for whom I was the center of his universe). Added to that, my husband and I have built an active and enjoyable life together. What is important to me personally, though, as I adjust to this stage of parenting, is to (1) maintain a connection with my son, and (2) know that he is okay. In my quest to sustain a connection, we frequently text each other, and routinely talk every Sunday by phone. Our Sunday calls, however, are often more interrogation than chat. Our son is not naturally talkative – he doesn’t hide information, but he doesn’t freely volunteer it either. Therefore, expertly framing and posing the right questions is a key skill when talking to him. When physically with him, however, we have long conversations (usually over meals) and I feel connected and caught up with his life. Since he had plenty of time on his hands (waiting for flight training to start) our Florida visit was pure gold. He was relaxed; we talked, laughed, and enjoyed several activities (and daytrips) together. He and I have always shared a sense of humor (that sometimes stumps even my husband) and he can make me laugh like few others. We are fortunate that our son still enjoys spending time with us (or at least cheerfully tolerates it). And though I admit I occasionally still long for my little boy, there are many parts of this stage of life that I enjoy even more. What a godsend to realize I’ve raised someone that I truly like! Most importantly, I was able to do my “Mom’s Due Diligence” and feel content that my son is okay. I saw his apartment. It is attractive and in a great location. I met his two roommates. They are polite and respectful. I visited his workplace. I inspected his car. No scrapes or dings, and it has been conscientiously well maintained. I met some of his friends. They are solid buddies. I went to his volleyball and basketball games and chatted with his teammates. They are affable and supportive. He introduced us to his new girlfriend. She is adorable, funny and smart, and she clearly appreciates my son and treats him with respect. I know I will have fewer such opportunities to pop into his life as his career progresses. The future may be uncertain, and although it may not always be so, for now, we are connected and the kid is alright. And so am I. And that is my Thanksgiving blessing.